Sept. 28 (UPI) — Denver Broncos players issued a statement Thursday afternoon saying that the team will be standing for the national anthem. Some Broncos players stood, some knelt and some linked arms before last Sunday’s 26-16 loss to the Buffalo Bills at New Era Field in Buffalo, N.Y.
Denver was one of many teams around the league to peacefully protest during the anthem. The protests came two days after President Donald Trump spoke at a rally in Alabama. He asked the attendees at the rally if they would “love” for NFL owners to fire players who protest during the anthem. “Last week, members of our team joined their brothers around the NFL in a powerful display of unity,” the players’ statement said. “It was an emotional time for everyone, including the fans who support us each and every week. As controversial as it appeared, we needed to show our collective strength and resolve. “Make no mistake — our actions were in no way a protest of the military, the flag or those who keep us safe. We have nothing but the deepest love and respect for those who protect our way of life and the freedoms we enjoy as Americans. “While there’s no greater country, it’s not perfect. Inequalities still exist, and we have work to do in forms of social justice. We can all do better. “It starts with us. We need to do our part and use our platform as NFL players to continue driving that positive change. “Our locker room is one diverse place, and that’s what makes it so special. It’s where thoughtful, intelligent leaders from all different races, religions and backgrounds come together. We’re a team and we stand together — no matter how divisive some comments and issues can be, nothing should ever get in the way of that. 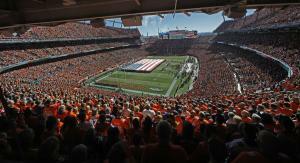 The Broncos are hosting an NFC West rival at 4:25 p.m. Sunday in the Oakland Raiders at Sports Authority Field.